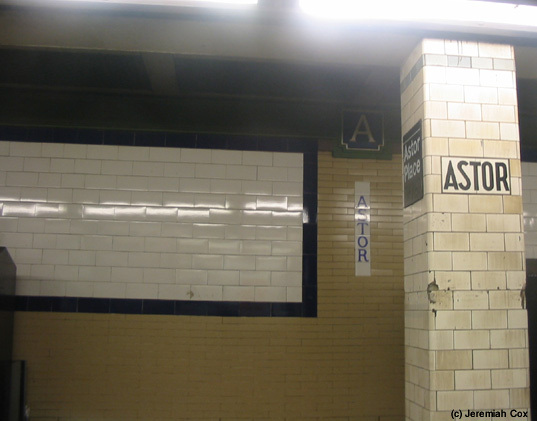 Astor Place is a famous subway station for the terra-cotta releafs of Beavers that still dot the original portion of the station platforms by their only entrances. 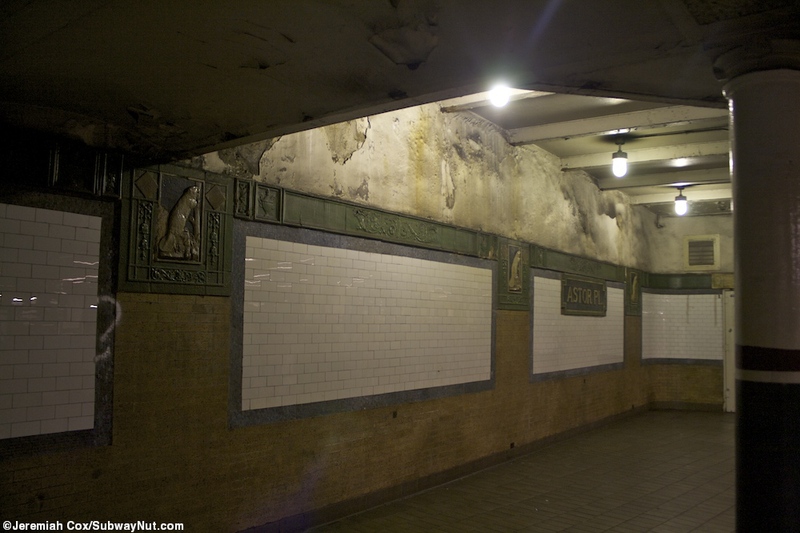 These and other decorative works have caused the station to be placed on the National Register of Historic Places. 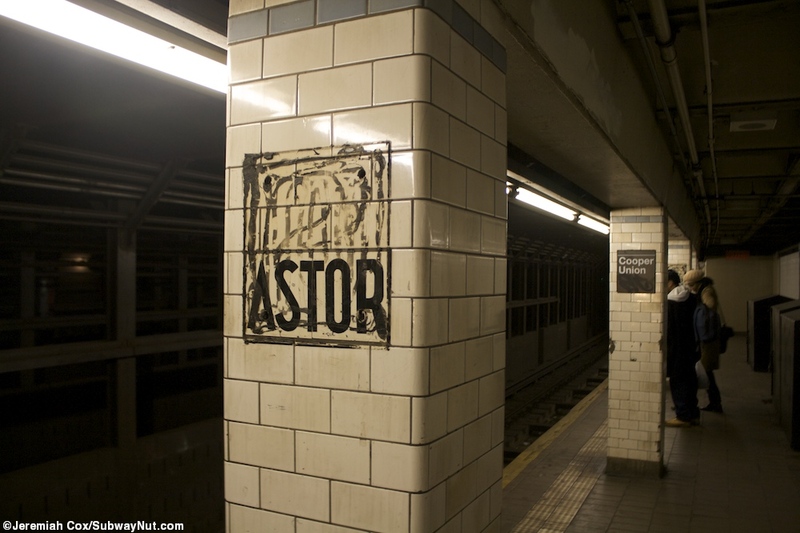 These reliefs have little As beneath them and are designed to represent the wealth James Astor made in the Beaver trade. 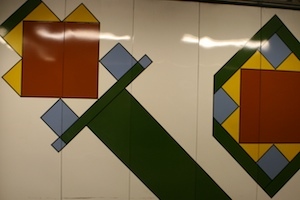 There are also terra-cotta re leaf name tablets, and round platform columns painted with green bottoms and middle red stripe and a white top to attempt to replicate the original paint job. 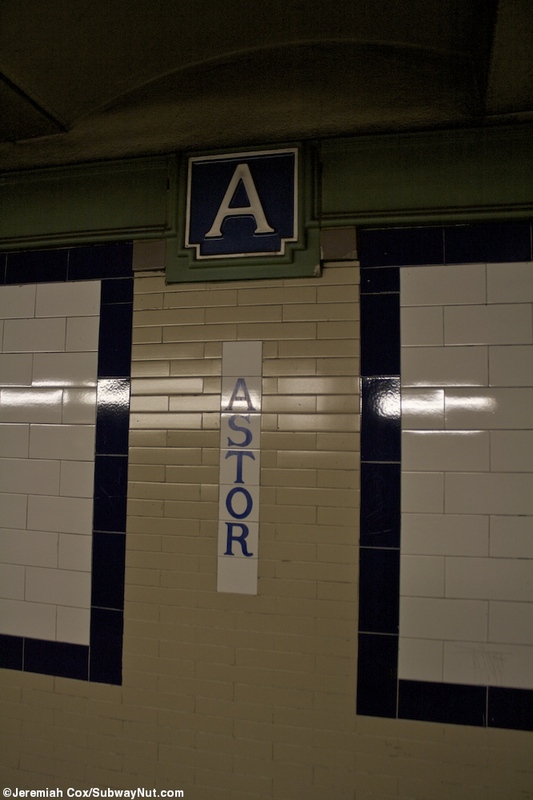 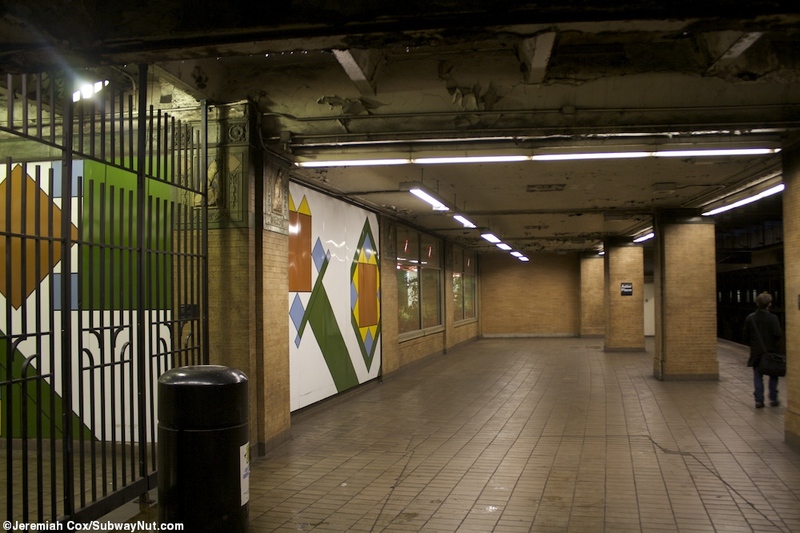 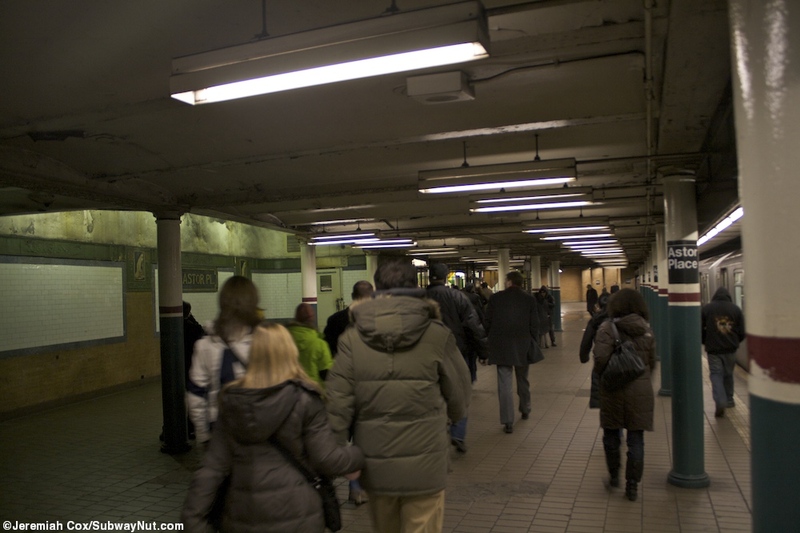 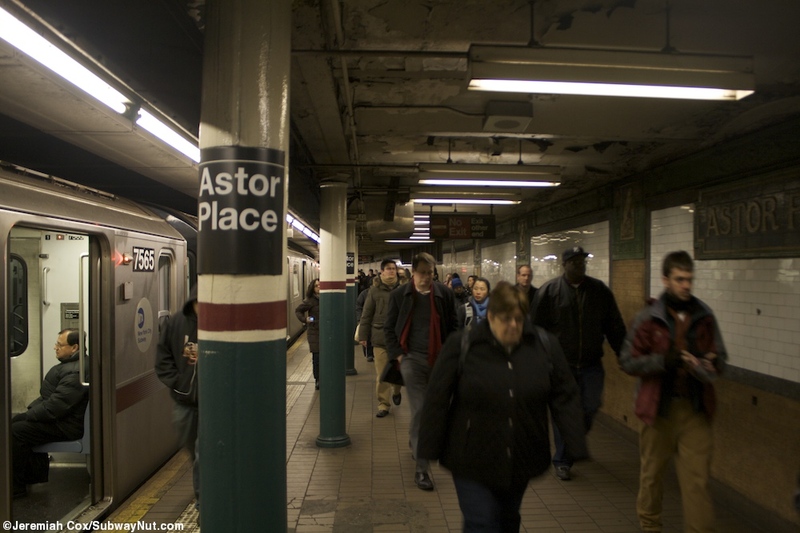 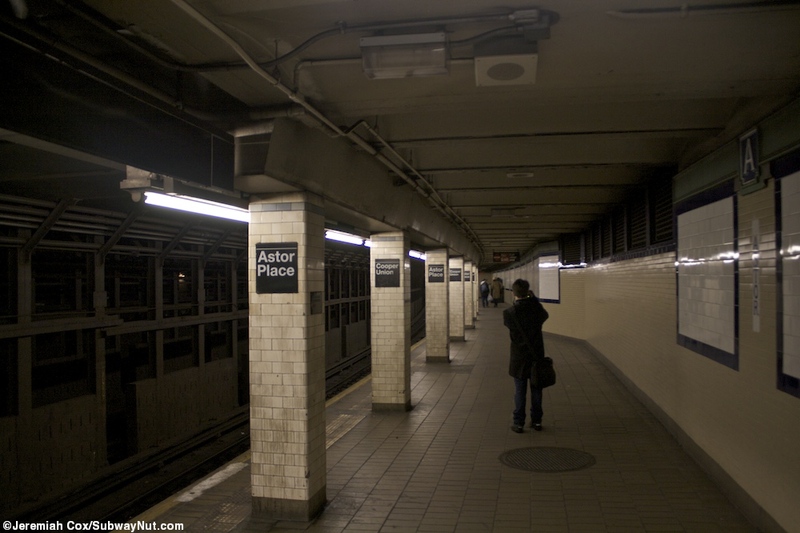 The extension portions of the station has simple tiled over columns that say Astor on them, the column signs alternate between Astor Place and Cooper Union, a trimine that is a green 3D relief at the top of the platform walls but just white As on a blue background. 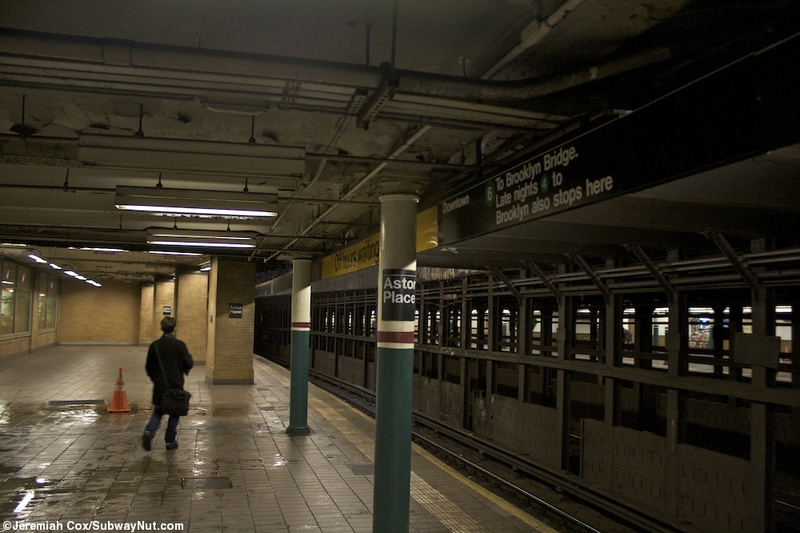 The platform extensions are offset from one another, the downtown south and the uptown north. 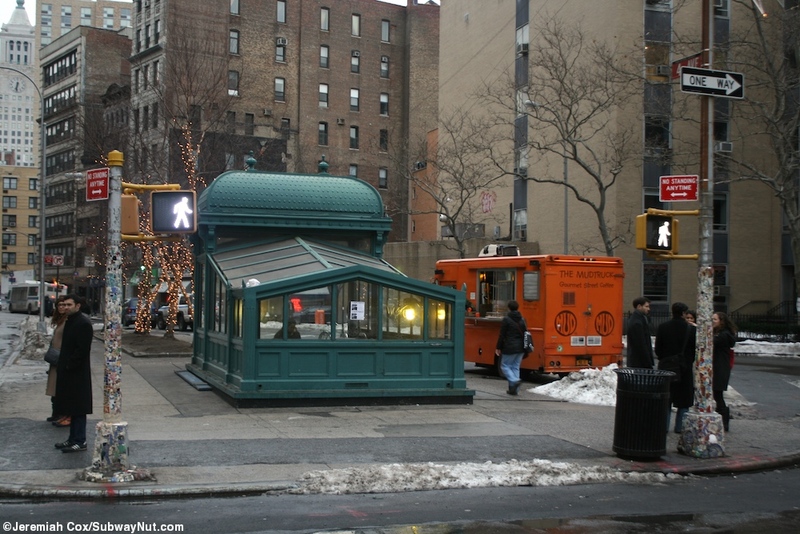 There is no free cross-over or under. 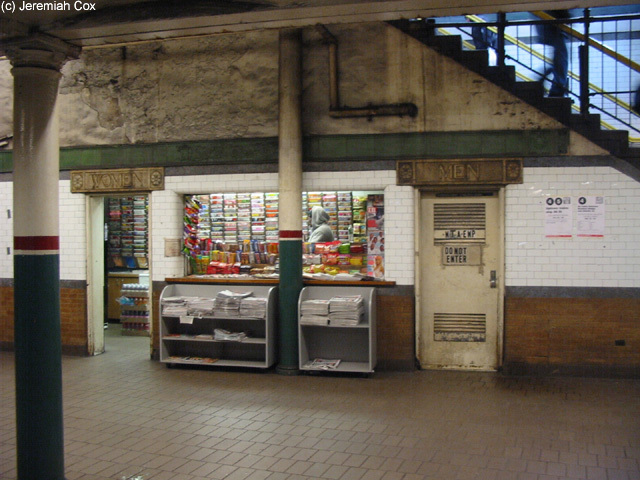 The entrances are in the original portion of the station. 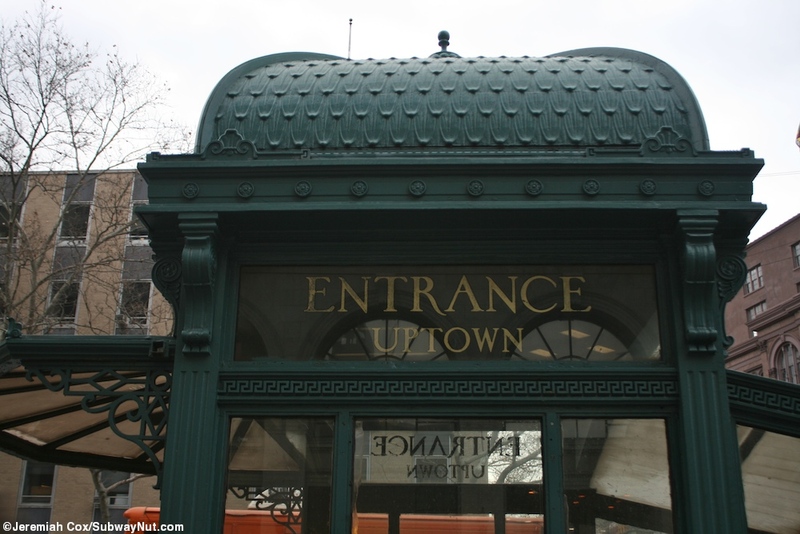 The uptown platforms single entrance consist of a replica ornate iron and glass kiosk at the triangle formed by the end of the Bowery at Lafayette Street and Astor Place. 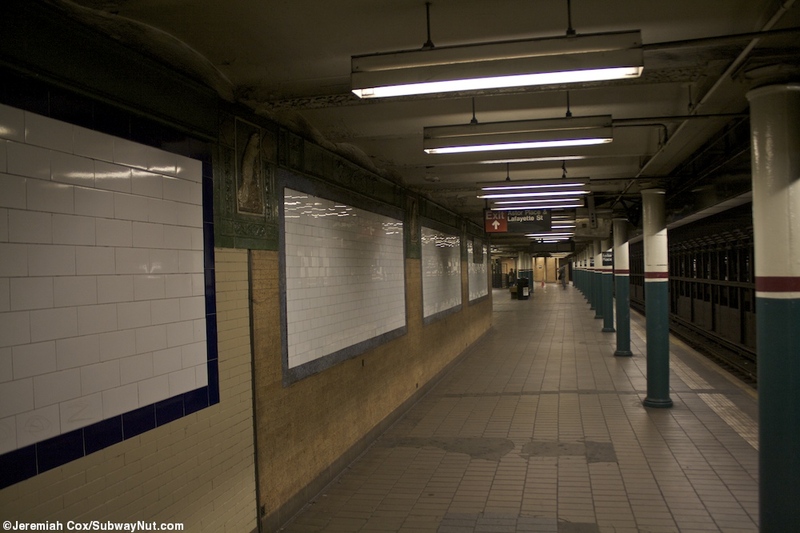 This leads down to a small fare control area where the turnstiles are at the southern end of the platform, the extension runs north. 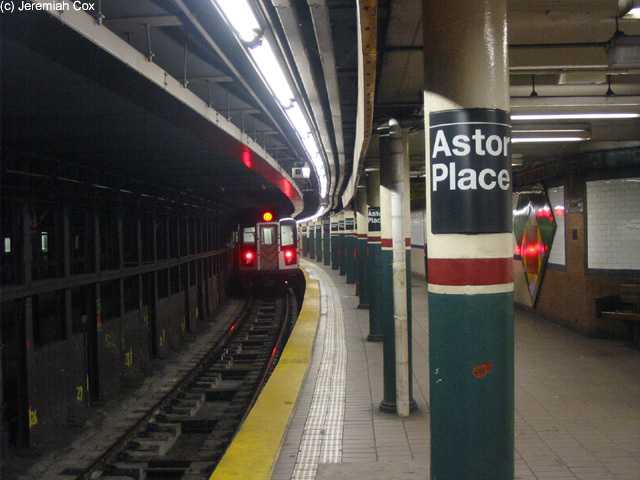 The downtown street stair is along the west side of Lafayette Street on the tiny block between Astor Place and East 8 Street. 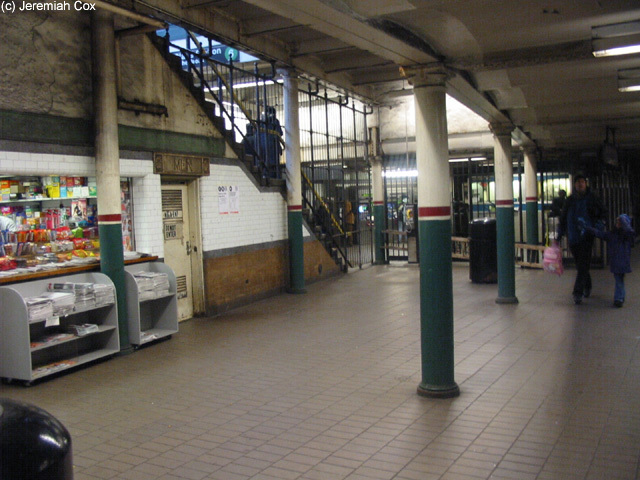 This leads down to a wide no longer staffed turnstile area with some MVMs, and abandoned terra-cotta plaque for 'Clinton Hall' at a tiled up doorway, but there is still an entrance directly into K-Mart which was a branch of the Wanamaker Department Store in 1904 when the station opened. 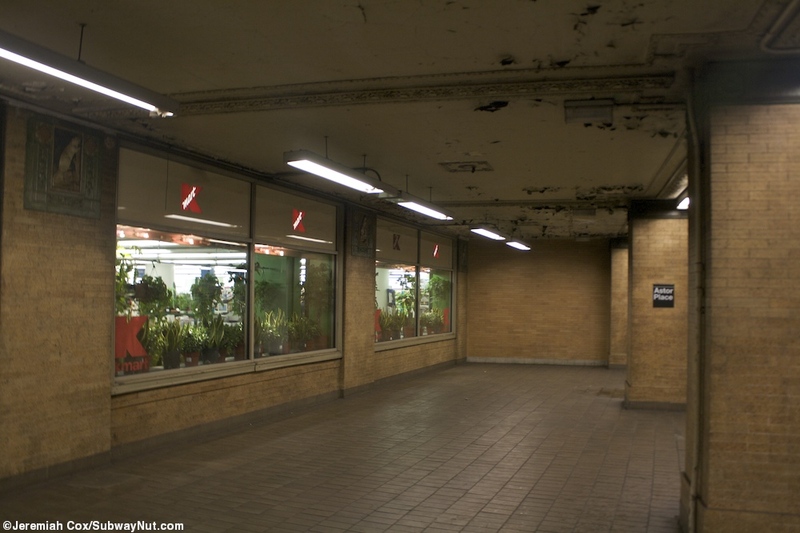 The store still has two store windows right onto the northern end of the downtown platform in an unusual portion where it's all brick walls, the extension to fit ten cars of a modern subway train extends south.